Our Ada Avenue project is well underway and we are making great progress to meet our Christmas deadline. The exterior wood work of the house has received a new coat of paint making it feel so fresh, especially in the welcoming Spring sunshine. We said goodbye to the old forest green colour and updated it with a modern and contrasting dark grey and crisp white palette. The landscaper will be starting on site soon and we look forward to seeing him work his magic in the generous garden by adding new layers of flowers, plants and trees. We have simultaneously increased the veranda space outside the kitchen and family room, and created new, larger openings, achieving our goal to allow much-needed light in to the interior of the home. The house has a much better indoor-outdoor flow, which now directly connects the living spaces to the enviable outdoor entertaining and pool area. Inside we say hello to a modern and generous kitchen with all the fittings and appliances you could dream of – wine fridge, large pantry, fridge drawer, oversized cooktop and porcelain butlers sink. 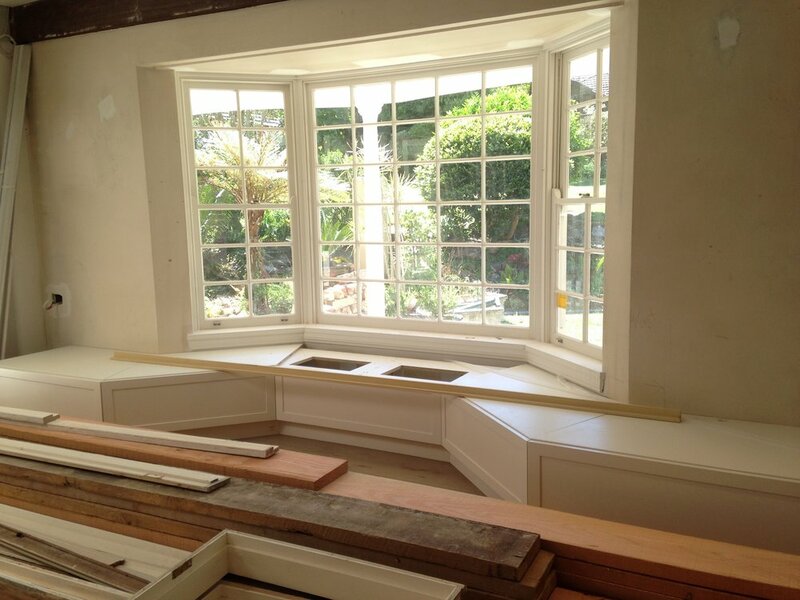 The cozy breakfast nook is taking shape and we love the practical addition of the generous built-in storage banquette seat. We have introduced some new arches to the spaces, staying true to the original design of the house but maintaining a modern approach. The new bathroom tiles are the perfect expression of softness, introduced by quality natural stone with a handmade feel. 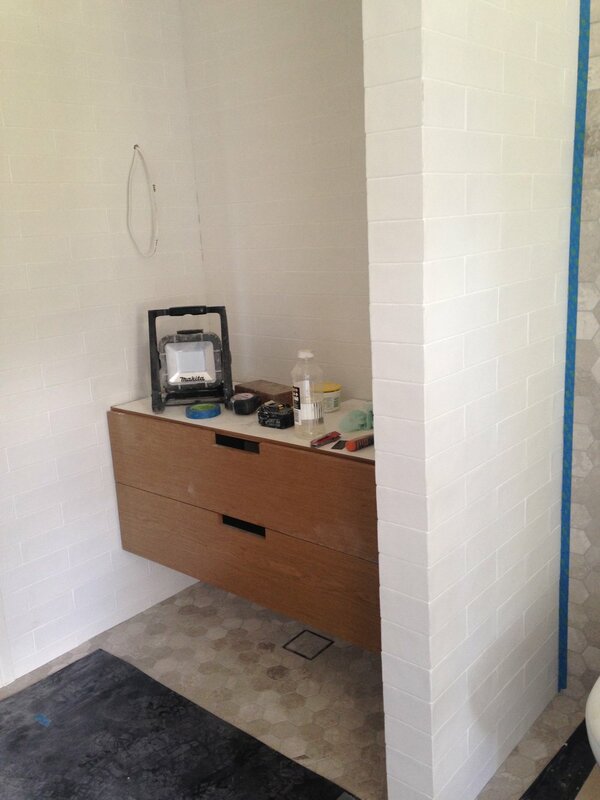 The new bathroom palette is made up of a beautiful combination of mineral stone and warm timber. The luxurious walk in robe is also being dressed up with warm timber ready to receive its handmade leather handles very soon. We can’t wait to add our final layers of soft furnishings, ready for our lovely client to move back in and enjoy his new home. Re-visit the project Under Construction.